Thank you for joining me today for this weeks Stampin' Up! Artisan Design Team blog hop! Hopefully you have arrived from Wendy Weixler's blog. If not, keep clicking on the button at the bottom of each blog post and hop to work your way back around. Since there is one extra week this month, we all are making a project of our choosing this week. Also, most of the Artisan blogs are giving away a little blog candy! Due to Stampin' Up! 's policies, us Canadians are unable to ship actual product to the US, so I will be sending one lucky winner the 2 cards featured below. All you need to do to be entered is comment below in the comments section by midnight on May 31st (MST). Both of my cards this week feature the New In Colors. They are so fun! This card uses the In Color Designer Series Paper stack, the 3/8 Ruffle Stretch Trim in Strawberry Slush and Coastal Cabana, the Chalk Talk stamp set, the Modern Mosaic Embossing folder and the Simply Pressed Clay and mold. My 2 favorite colors are Strawberry Slush and Coastal Cabana, I love the way they look together!! This next card also features the In Color Designer Series paper stack and the 3/8 Ruffle Stretch Trim in Coastal Cabana. 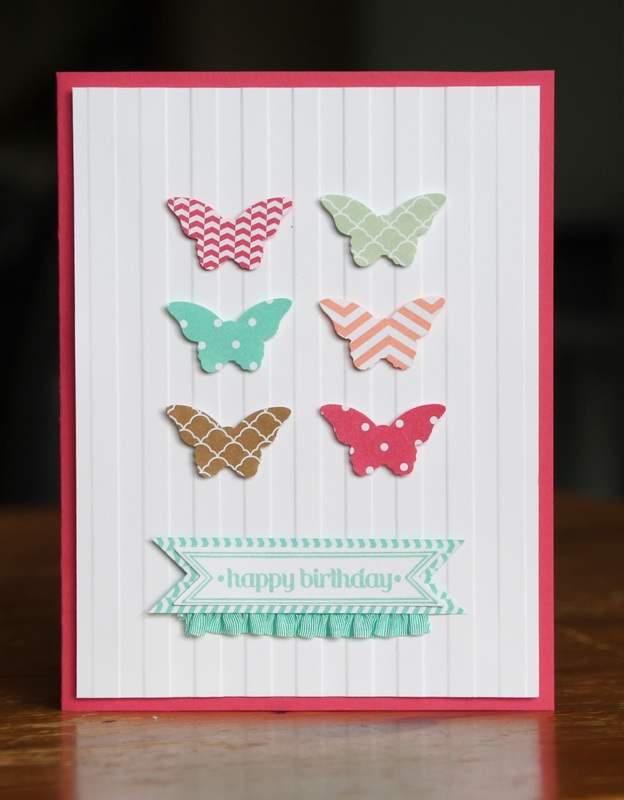 The little butterflies are punched out with the Bitty Butterfly punch and the background is embossed with the Stripes embossing folder. I love these cute little butterflies! Up next is Cindy's blog, make sure you check out what she has to share with you!! Love your cards. I'm really loving the new SU colors. Thanks for sharing your talents with us. so pretty, love those butterflies!! Great colors. I've enjoyed seeing all your projects. The colors are just luscious! They are both so pretty! I love both of these cards! The new in colors are amazing! Your cards are so cute! Great colors and design. Thanks for sharing - hope I win!! Beautiful cards! Love the new product shown on them. Beautiful cards. Would love to win them! Beautiful cards. Thanks for the chance to win. 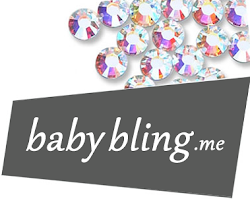 Follow you every blog hop! Very pretty! I love how you used the negative side of the embossed paper. Awesome job! I like your mosaic card!I haven't seen a card with these that I liked as well! The butterflies are cute as well. Thanks for offering an "extra" bonus this week! I love seeing what you are going to create each week. Thank you for sharing. Super cute! Nice cards! I too am in love with the new In Colors this year. They are all so beautiful. 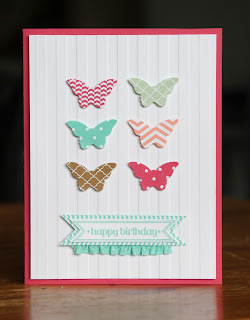 Wonderful cards....loving our new in-colors and how wonderfully you used them in both cards! I so love your cards. My favorite color scheme. Love these cards and the colors! Thanks for the chance to win!